Synthetic turf is increasingly being preferred over natural grass as a smart option for maximising the use of exterior spaces throughout the year. Premium grade artificial turf delivers multiple advantages including high UV and moisture resistance, durability and easy maintenance. Being soft underfoot, it is safe for children and pets while the assurance of a lead-free material with no heavy metals or harmful chemicals eliminates all concerns. Unlike grass, synthetic turf is pesticide and fertiliser-free; being recyclable, it also makes for an environment-friendly choice. However, until recently there was no easy way of combining turf with other surfaces such as decking and tiles. Seeing the potential for a versatile solution, Outdure added the turf base board to their modular QwickBuild structural framing system, enabling turf to be installed easily over waterproof membranes, uneven natural ground and concrete. The only framing solution for low height decks that integrates tiles decking and turf through a range of hidden accessories and fasteners, the Outdure system allows architects, builders and homeowners to be creative with their designs. 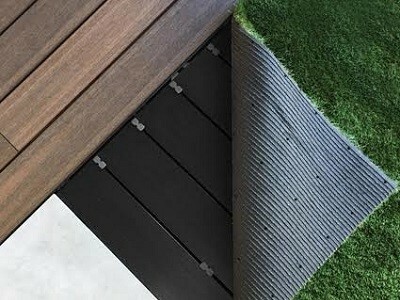 Outdure’s UltraPlush Turf range includes three options in different colours and textures, and can be installed separately using traditional methods, or combined with Outdure’s ResortDeck and structural exterior tiles ranges.